Are you a sole trader who considers taking things up a notch, by recruiting his first batch of employees? If the answer is, then this article is for you. Growing could be more complex, and more challenging, than you would have expected. The shift from a sole tradership towards an SME is one the most crucial shifts in the lifecycle of a business, and commonly, it induces a multitude of hurdles to go along with it. In order to have employees working for you, you would need to recruit them. You would need to train them. You would need to manage them on a day-to-day basis. That means a lot less time for you to work on the core of the business. In order for your business to sustain, you have to make sure you are recruiting the right employees. You have to make sure your business can withstand the costs, and you also have to be certain the return on this investment becomes positive at some stage. You need to delegate some of your responsibilities, to the right people, at the right time. All of the above requires meticulous planning. Motivation, talent, and goodwill can take you places, but without the appropriate planning, they may not be sufficient. The road to success is paved with good intentions, but so is the road to hell. Think of a doomsday scenario where you need to let some, or all, of your employees off, after only a short while. Either because they were unfit to the job, or simply because your business was not yielding what you expected it to yield at this point. Think of a situation where you over-recruit, resulting in one or more employees, who are not only misutilized, but also get in your way, and impair the workflow. Imagine a situation where there’s no appropriate division of work, nor a coherent plan, leading employees to perform work either excessive work on projects you do not care for. A small business ran wrongfully and carelessly is a nightmare, for both its owner, and its employees. Why are you recruiting right now (and not earlier, or later on)? Which functions do new employees need to serve? Which responsibilities will be delegated to them? Which responsibilities will not be delegated to them? What terms can you offer them? What is the short, medium, and long term vision for the business? Try to answer the questions above in the most thorough way you can. Write everything on a piece of paper. That will serve you in latter stages. The goal of this exercise is to verify all aspects have been thought through. If you are not sure why are you recruiting, or why is “now” the right time, I suggest you take a step back, and rethink your move. If you can’t clearly express how recruiting more employees would help your business, it might be too early for you. If you are not sure what do these new employees roles will be, and which aspects of your current role will be delegated to them, the recruit stage is bound to fail. If you don’t know what the role specifications will be, how can you find the right person to do it? It is advisable you invest further thought into this topic, or use professional consultancy. If you don’t know the salary you are able to offer your employees, you need to crunch down the numbers, and create a proper P&L projection, based on your current resources, and expected income. Then, you need to play around and figure out your limitations in regards to wages. Until you have a fleshed out projection, recruiting is ill advised. After you have loosely-worded your ideas and thoughts on the matters above, it’s important to formulate them into digestible, easy-to-update, documents. Responsibility Matrix: detailing which employee is responsible for which aspect of work, you included. Business projections and plans: before financial projections take place, it’s important to project and plan the operative side of the business. Instead of using financial figures, use milestones relating to actions around the realms of production, marketing, and sales. Financial project and plan: In correlation with your business plan and projection, you should assume how much are you going to spend, and earn, every month. Always assume the worst. Don’t be overly optimistic with your business or financial projections. You do not want to be hanging by a thread if you missed out on those. Consider the fact that upon recruiting you will spend less time on the business’ core functions, as you would train your newly recruited employees. So it is reasonable to believe bottom-line results will deteriorate over the first 1-3 months of the recruiting phase. Keep in mind that with most professions and roles, it will take at least 3 months for an employee to hold a position before he becomes productive and efficient. Remember that the most common mistake for growing businesses is centralism. Delegate now to improve chances of growing later. After intense planning, the next stage is characterization of the roles, and subsequently, issuing a position description, and posting it. Using the responsibility matrix, you can understand what the role entails, but before you could call that a “characterization”, you need to think ahead. How do you envision your business’ next stage, and which role would the employee has there. When you combine the two, your current needs, and future prospects, you are likely to achieve a “sexier” position description, and thus attract more ambitious individuals (which is exactly what you’d want, with early-stage businesses). If the role is still not attractively-sounding, you might want to re-consider the division of work, to make it one. Before you can post the job ad, you should fill out your qualifications. Those are tricky. Try to avoid copying your competitors, as you need employees of a “different breed” in comparison to well-established, larger, businesses. Instead, try to use your intuitive knowledge of the business, and try to think which qualifications could actually help a candidate to fulfill the role in optimally. Training your employees the right way has a significant effect on the longevity of your business. Employees who have been mistrained are likely to perform badly, and become less motivated quickly. Plan. Similarly to other aspects of your business, training requires the appropriate effort in preplanning. A comprehensive, concise, plan, can not only help you verify everything is covered, but also help your employees to prepare for the training. Don’t overstress. Be well prepared to the fact that during the first 3 months, you’ll devote a significant chunk of you time towards training, while your employee would not be productive at this stage yet. That could potentially lead to a small deterioration in the business’ income. Treat it as a necessary, temporary, evil. Prepare written material. Finding relevant reading materials to aid you, as you would not have to spend every moment frontally training your employees, and would help them by giving them time to read, think about what they’re reading, and perform additional research on their own. Focus on the wider picture. If you want an employee that can grow, you will need to focus your training on the market the business is operating in, as well as the nature of the business, and what skillset is required in order to grow in this line of business. That would position him in a good starting point to grow on his own. Measure. Even though you don’t expect the employee to become productive during training, it still doesn’t mean you don’t need to test his understanding along the way. Be sure to ask many questions, and prepare milestones, to help you understand if things are moving in the direction, and pace that you hoped for. 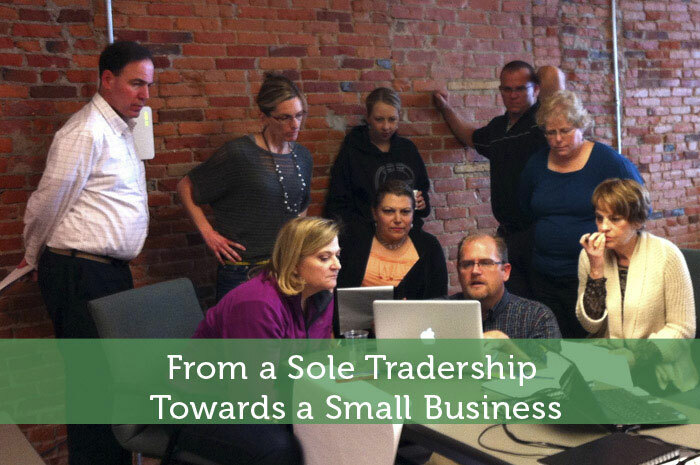 Being a self-sufficient sole trader is one thing, and being a manager is a whole other thing. There are skills you should adapt, and habits you should keep in mind, in order to make the shift. Here are some things to follow in order to get there. Be organized. Keep all documents in one place. Make them easy to scan, easy to read, and easy to reach. Make sure they are constantly updated and always convey your latest thoughts. Make sure you work with these documents, and your employees follow them religiously. Being organized is the best way to reduce overheads. Be clear. Avoid back-and-forth conversations by being very explicit in your requests, and detail them meticulously (either send by email, or write yourself a summary of a verbal conversation you had with your employees, in order to keep track). Be cool. Stress is counter-productive. Addressing issues, positive or negative, by explaining them in a relaxed manner, and providing constructive criticism, is more productive. Be a manager. Even though friendliness is always welcomed and can contribute greatly to an effective work environment, there a line you should not cross. Getting too friendly with your employees will make it difficult to demand things from them. Make sure your employees view you as a manager, first and foremost. Set an example. The best way to encourage your employees to work hard, is to set a personal example. Leadership is believed to be the number one motivator. Set objectives. Using milestones, you can always verify the business is running according to what you had planned and projected (both financially and operatively). When these milestones are well communicated to a team of employees, they become impactful, allowing employees to know what is expected of them. Although there are many stumbling blocks down the road, there is no way around recruiting if you want to grow your business. I am hopeful this guide will help you smoothly skip over some of these hurdles.